Janis Thomas wants you to try something new. 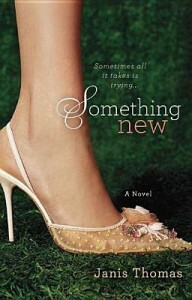 The author of the mom-lit book, “Something New,” (See? clever.) wants us all to break out of our ruts, get off our butts and try something we’ve never done before. If you’re wondering what you can do between carpools, holiday shopping and meetings, take inspiration from Janis, who tried something new this month by trying out for a new CBS baking show. Move over Cake Boss. Janis Thomas is trying something new!